Refugees in Lebanon face a violent troika: the state, the Lebanese bourgeoisie, and the weather. 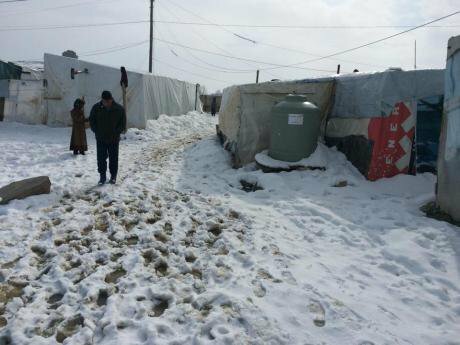 Al-Marj refugee camp, Beqaa, Lebanon 9/1/2015. At least 3 refugees have been killed by the storm so far. Photo by Syrian Eyes.Life in Lebanon has become more grueling for Syrian refugees since I wrote on the proliferation of anti-Syrian sentiment amongst the Lebanese back in September. Hostile attitudes towards our Syrian ‘guests’, while already prevalent, have steadily become more dominant and more pronounced. A particularly shameful article (Arabic) titled “Hamra [Street] is no longer Lebanese…Syrian expansion has altered its identity” caused an uproar when it was published in An-Nahar’s print and online editions on January 6, 2015. An-Nahar is Lebanon’s most widely-circulated newspaper and one of its oldest and most prestigious. The article deserves to be examined, not for its merit, but because it contains a damning caricature - that unintentionally borders on the satirical - of the specifically bourgeois variant of Lebanese anti-Syrian bigotry. In addition to having to deal with a hostile population and vitriolic media, new entry policies put in place by the Lebanese government have severely restricted access into Lebanon for Syrian refugees fleeing the war back home. Finally, an exceptionally harsh winter spent in dismal, ill-equipped shelters (if any) coupled with the temporary suspension of the World Food Programme’s much-needed aid distribution programs have made life unbearable for many of Lebanon’s Syrian refugees. The flow of refugees into Lebanon has, until recently, continued unabated. According to a recent UNHCR report, there are 257 Syrian refugees per 1,000 inhabitants inside Lebanon today, making Lebanon the country with the highest refugee density in the world. The Lebanese government took its first concrete step towards limiting the influx of Syrian refugees into the country in October of 2014, when entry procedures for Syrian nationals were tightened. Syrians classified as ‘displaced’, as opposed to visitors who would eventually return, could be refused entry on a case-by-case basis at the discretion of Lebanon’s General Security apparatus. These procedures were formalized and finally put into effect on January 5. Syrian and Lebanese nationals have historically enjoyed the right to cross into either country without the need for a visa, ever since Syria and Lebanon came to exist as independent nation states following independence from French colonialism in the 1940s. But this has now changed. Syrian nationals who wish to cross into Lebanon must now apply for one of six visa types at the border and have their applications approved by General Security. Category I visas include tourism visas, business visas, and visas for real estate owners. Tourism visas are granted for a period equal to the duration of the applicant’s hotel reservation, business visas are granted for a maximum of one month, and real estate owner visas are granted for a maximum of six months. Category II visas are student visas, and they are initially granted for a duration of one week and then extended when proof of enrollment in an educational institution is provided. Category III visas are transit visas, granted to those who wish to enter Lebanon in order to travel through one of the country’s seaports or airport. These visas are granted for a duration of 48 hours for air travelers and 24 hours for those who wish to travel by sea. Medical visas are category IV visas, and they are granted for an initial duration of 72 hours and can later be renewed, only once, for another 72 hours. Category V visas are granted for a duration of 48 hours to Syrian nationals who wish to visit a foreign embassy on Lebanese soil. Finally, category VI visas are reserved for those Syrian nationals who do not fall under any of the above-mentioned categories. Syrian nationals who apply for this visa category must obtain an ‘oath of liability’ from a Lebanese citizen who is willing to vouch for them, and take full responsibility for their ‘stay and their actions’. This visa is granted for a duration of five days, and it can be renewed twice after this 5 day period for a maximum of 6 months. It is worth noting that Lebanese citizens are still allowed to enter Syria without applying for a visa, and the Lebanese government’s decision prompted a strong response from the Syrian government, delivered by Syria’s ambassador to Lebanon, who went so far as to threaten closing the Syrian border to Lebanese exports. “Lebanon would be harmed more than Syria”, he said. It is immediately evident that the new visa system was designed to compartmentalise Syrian nationals based on class; if you have money and assets you are allowed to stay, and if you are poor you are unwelcome, which brings us back to Hussein Hazouri’s horrid piece in An-Nahar. It is immediately evident that the new visa system was designed to compartmentalise Syrian nationals based on class; if you have money and assets you are allowed to stay, and if you are poor you are unwelcome, which brings us back to Hussein Hazouri’s horrid piece in An-Nahar. Hazouri begins by stating that Beirut’s Hamra Street, a historically cultural and intellectual hub and one of Beirut’s busiest streets, has turned “black” – an allusion to the Syrian skin tone, which Hazouri believes is darker than that of the Lebanese. He later says, “[Hamra is full of] people who have that dark skin that the Lebanese very well know is Syrian”. The Lebanese fashion the Syrian body in such a way so that they may forge an identity from the imagined contradistinction that exists between how they perceive the Syrian body, and thus the Syrian, and how they perceive themselves. This dark skin that all Syrians are supposedly characterized with is perceived as being inferior to lighter skin, because it is associated with poverty and uncleanliness. As I’ve argued before, the stereotype was partly inspired by the sunburned skin of Syrian migrant workers who comprise the largest part of the labor force in construction and agriculture, and who toil under the sun from dawn till dusk in every part of the country in return for meager wages. These are the Syrians who the Lebanese most often encountered. Economists disagree on the number of Syrian workers present in Lebanon before 2011, with numbers ranging from anywhere between 250,000 to 1,200,000 in the 1990s.The real figure hovered between 300,000 and 500,000 throughout the first decade of the 21st century. Syrian workers comprised the bulk of Lebanon’s Syrian population, but they were also more visible than the rest of the (more affluent) Syrian population, who cannot be distinguished from wealthy Lebanese. It is important to mention that colonialism and imperialism are also responsible for the internalised racism and reverence for everything western and ‘white’ that dominates Lebanese society and other parts of the developing world. After the article was published, Syrians and Lebanese took to social media websites to mock the article with memes that satirically highlighted the supposed differences in skin tones that exist between the Lebanese and the Syrians as per Hazouri, and businesses in Hamra issued a joint-statement condemning the article as racist, and denying the claims made by Hazouri with regards to how Syrian refugees are ‘bad for business’. Hazouri’s article is as abhorrently classist as it is racist, which is to be expected – it always boils down to class. What seems to bother Hazouri most is having to deal with the unwelcome intrusion of homeless Syrian refugees on his little bourgeois bubble of joie de vivre. Hazouri included a rather indicative quote in his article, from a 22 year old restaurant employee who works on Hamra. “The Syrians have occupied the country, which pushes many Lebanese to avoid the area because of all the beggars and the vulgar, low class scenes (of poor Syrian refugees) that dominate this area of Beirut.” This kind of rhetoric is regularly spewed by Lebanon’s upper classes, as was showcased by this brilliant satirical piece, which actually contains a terrifyingly accurate portrayal of reality. Lebanon’s wealthy very loudly and continuously voice their complaints about the Syrian refugee situation, when they are in fact the least-affected by it, if at all. This is in no way unique to Lebanon’s elite of course, but to the wealthy everywhere, for “the philosophy of enjoyment was never anything but the clever language of certain social circles who had the privilege of enjoyment.” Some of Lebanon’s poorer agricultural regions are close to breaking point, this cannot be denied, and yet the residents of these areas - who have suffered the most as a result of this crisis - have consistently been the most compassionate towards Syrian refugees. One Lebanese family I personally know of in the south is housing a Syrian family of 11 in its cramped and extremely modest house. Stories of solidarity like this one are all too common, and the sacrifices these people make are real, as opposed to the feel-good activism (what they call giving money that they do not need) of Lebanon’s upper classes. They whine when it is in fact the poor, both Syrian and Lebanese, who bear the brunt of this crisis.